“Trophy hunting” is the one form of hunting which receives the most severe international criticism and is threatened by a general ban. The reasons for this are on the one side a wrong perception of what so-called trophy hunting is all about and on the other side some seriously harmful and detrimental practices and trends among so-called trophy hunters themselves. A thoughtful “repositioning of hunting”, as initiated by the Namibian Ministry of Environment and Tourism in the African Wildlife Stewardship Programme, is of paramount importance. The terms “trophy hunting” and “hunting trophy” seem out-dated and incorrect. What is questioned here is, if correctly applied and executed, in fact, the most selectively responsible form of hunting. The term “trophy hunting” should be replaced with “selective hunting”, while “hunting trophy” should be replaced with “memorabilia of the hunt”. These terms will be used throughout this feature. Conservation-orientated hunters and other stakeholders are increasingly concerned that the constant removal of breeding males in their prime (or even at a younger age) has a severe effect on the gene pool of the hunted species. This does not only affect the trophy potential of the species in question but its entire genetic health. This genetically unsustainable trend is enhanced by a wrongly understood trophy cult and in particular by the measuring systems of existing record books for African Game. The ART Measuring System aims at creating incentives to hunt truly old animals past their prime and to discourage the hunting of immature animals altogether. It furthermore aims to underline the attraction and charisma of the often worn hunting memorabilia of old animals. 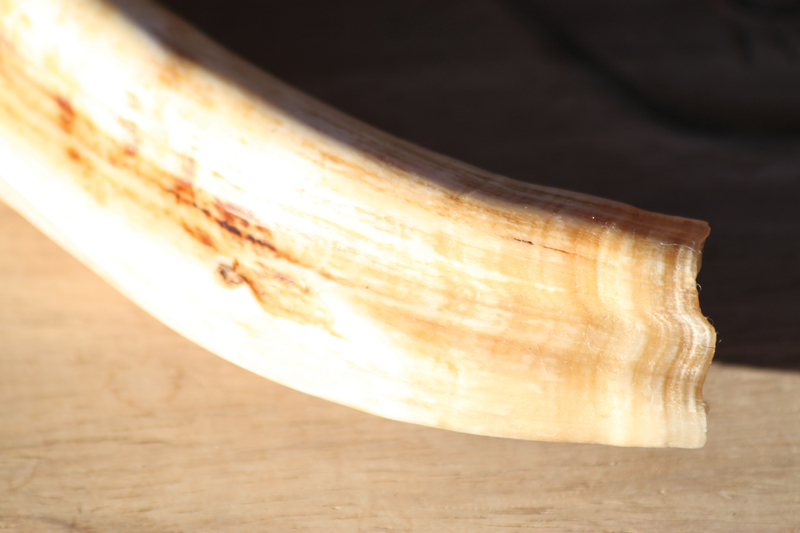 It appears very important to be proactive and implement a measuring system, which is based on scientifically tangible age criteria reflected in horns, tusks and other natural artefacts which selective hunters like to keep for aesthetic reasons or as a reminiscence of their hunts. 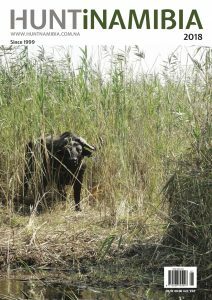 By this, institutions like USFWS, the EU or other bodies engaging in importation of such products, as well as conservation institutions like IUCN and others are provided with non-detriment findings for selective hunting, and moreover, the hunting fraternity is provided with valid and irrefutable arguments to justify selective hunting as a very effective conservation tool. It must be emphasised that while the ART Measuring System concentrates on genetic sustainability of selective hunting, all regulated conservation hunting activities, including selective hunting, has to be subordinated to the overall sustainability of all hunting via responsible quota setting. It furthermore has to be emphasised that selective hunting is the form of hunting which, if applied correctly, has the lowest impacts on the hunted species and delivers the highest financial outcome. Secondary and inward growth at the base in a past prime blue wildebeest. Soft, grey, velvety base in immature springbok, though a very big trophy. 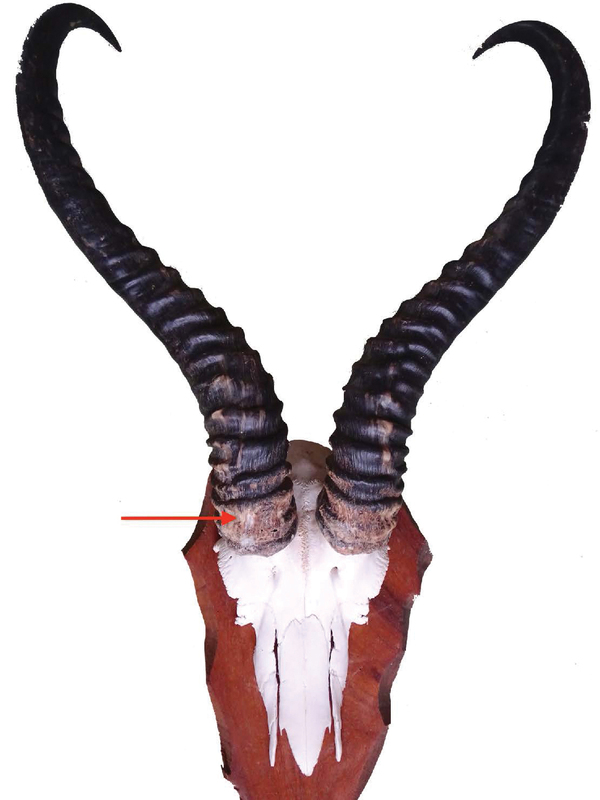 Secondary and inward growth, as well as heavy wear in very old oryx bull, the arrow indicating stage when prime was reached. 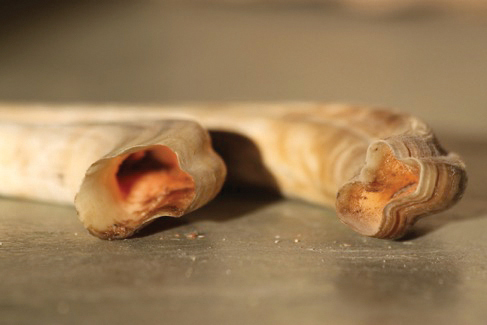 Large nerve cavity in young warthog tusk (left); small nerve cavity, twisting and laminar growth at base in old warthog (right). Secondary and inward growth in impala past the prime. Laminar growth at tusk base in old warthog. The horns and tusks of game animals are not trophies to the animals themselves. Quite contrary, they are weapons (and to lesser extent tools) designed to serve a very distinct purpose. This purpose is mainly to enable the carrier to fight for dominance within the same species; largely for mating rights or territories related to mating rights. To a lesser extent, these horns and tusks are used to defend the individual or the herd against enemies and, in tusk- carrying species, for digging and debarking of trees. The growth and development of horns and tusks of the animals into a fully functional weapon and tool is closely related to the physical development of the animal into sexual maturity and full physical capacity in reaching the prime stage of the animals’ life. 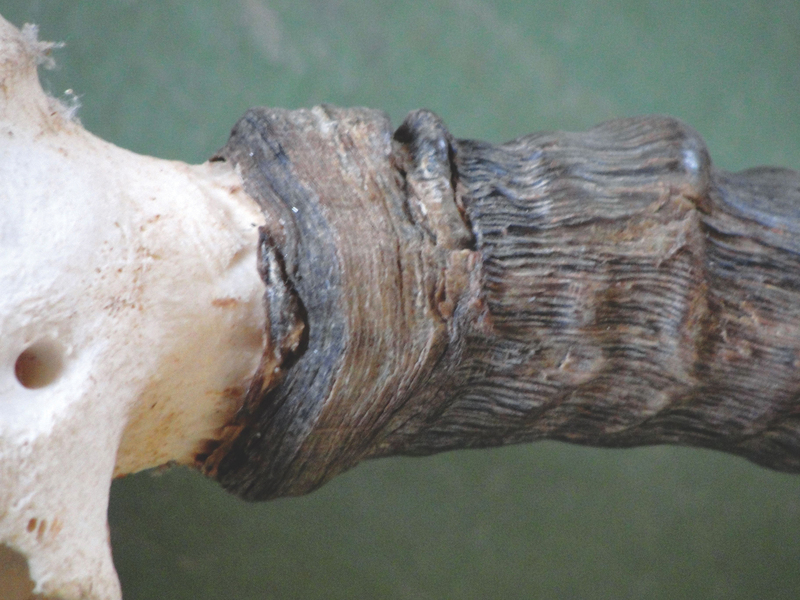 The physical development of ungulates into sexual maturity to some extent depends on field conditions and availability of fodder. In the same way, life expectancy varies with fluctuating rainfall cycles towards the end of an animal’s life. Therefore it appears more sensible to identify age classes, rather than to work on actual age in years. These age classes are “immature”, “prime” and “past prime”. Once the stage of “prime” is reached, the outward growth of horns and tusks largely comes to an end. Now the horns and tusks have developed into the weapons they were designed to be. 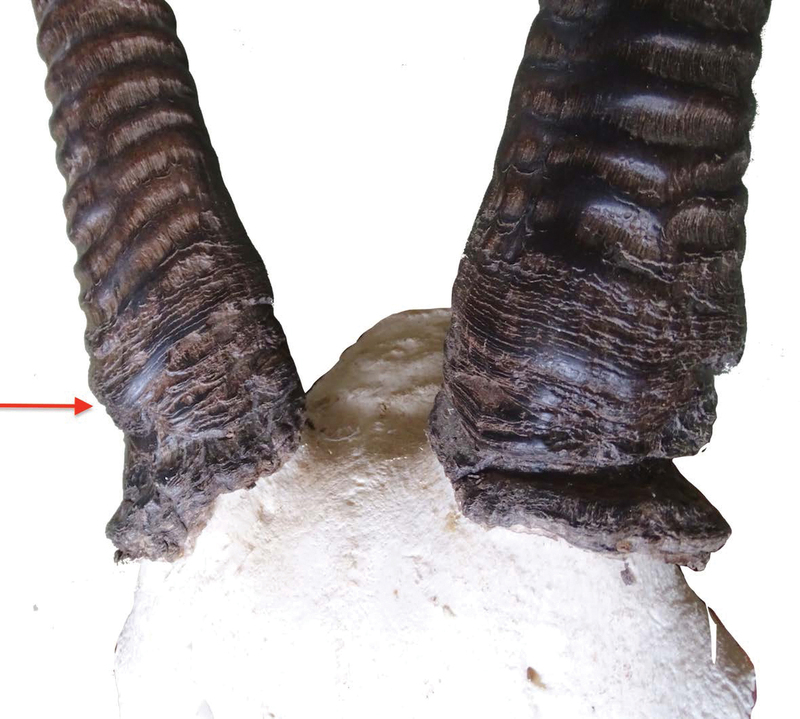 From now on only limited secondary growth takes places, which easily can be differentiated from the primary growth, in particular in the case of the horns. 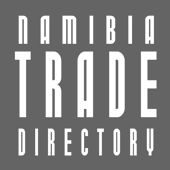 The Art Measurement System was developed by the Erongo Verzeichnis für Afrikanisches Jagdwild and remains the intellectual property of the Erongo Verzeichnis für Afrikanisches Jagdwild, which is a registered trademark.